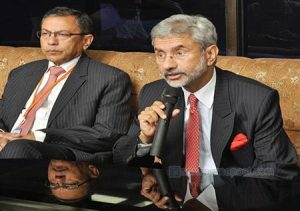 Concluding a two-day official visit to Nepal, Indian Foreign Secretary Subrahmanyam Jaishankar has returned home on Friday. Indian Foreign Secretary Jaishankar held separate meetings with President Ram Baran Yadav, Prime Minister Sushil Koirala, Foreign Minister Mahendra Bahadur Pandey and senior leaders of major political parties during his Nepal visit. According to Prime Minister Koirala’s Foreign Relations Adviser Dinesh Bhattarai, Prime Minister Koirala has assured the Indian Foreign Secretary to support India’s candidacy at the United Nations Security Council for permanent membership. “I conveyed to Nepali leaders that India is committed to working with the people of Nepal for a democratic, stable, peaceful and prosperous Nepal,” Jaishankar said.